One of Vail Oxley’s most popular works, “The lily garden” takes us to a simpler time when large and ornate gardens were prized for their beauty and peaceful serenity. Inspired by locations in the countryside around his home in Beijing, China, Oxley’s work depicts a lovely lily pond surrounded by statues and urns overflowing with flowers in full bloom. Like most of his work, it captures a moment in time for all to see and highlights his amazing control over composition, light and color. The reflections in the pond are perfect in every way, as is the shadows of foliage that are cast along the pond’s edge. 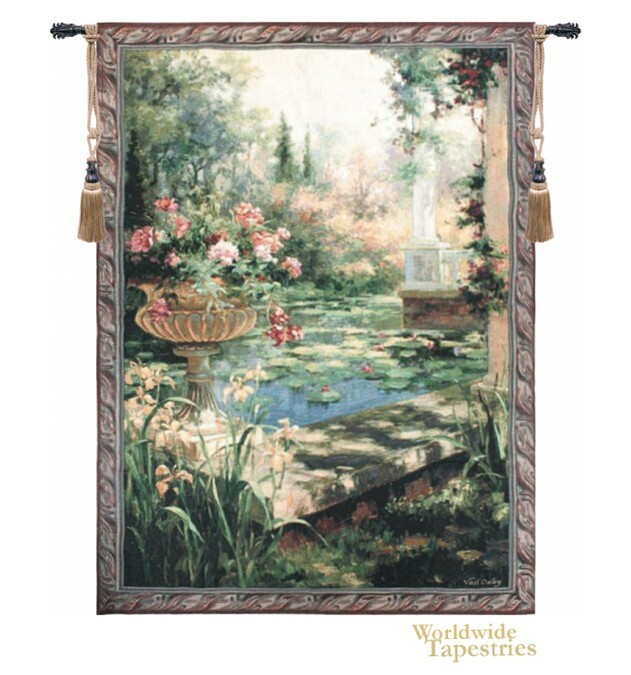 “Lily Garden” is lined at the back and has a tunnel for easy hanging. Note: tapestry rod and tassels, where pictured, are purchased separately.